Here is a royal family, consisting of the medieval king, the queen and the smallest, the prince. They are 7”, 5" and 4" tall respectively, in excellent unused condition. The prince doll does not open. The set is wood burned and in excellent condition. A set similar to this one sold for $155 to olgaku 02/04, and an older 5n set sold for $328 to sinedchat 07/04. 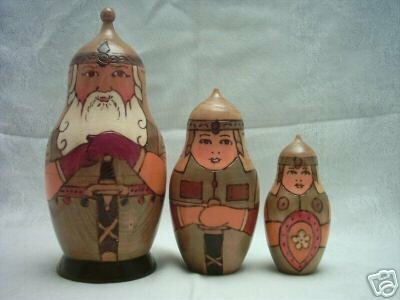 Sets like this are sometimes marked “Zagorsk” and were sold at the 1967 World’s Fair in Montreal, Canada.